Months have passed at the front and Willie is upset that Gretta has not responded to his letters. He writes to her declaring his love, and retains the hope that she loves him too, but feels more and more angry and humiliated by her lack of reply. Before leaving Gretta, it transpires that Willie has asked her to marry him, and she refused. He once understood the reasons for her refusal, but longing for her without remittance, he writes short letters that veer between lumpen description of life in the trenches and blurted declarations of love. Writing in this way sharpens his self-consciousness and anxiety. It is now spring and the Fusiliers decamp to a section of line near the village of St Julien. The men relax somewhat, skinny dipping in the river together and playing football. They find a joy in their momentary leisure together, though the noise and bustle of the front is near. Disarmed and naked, they talk frankly at the riverside; amidst the aimless chatter Captain Pasley speaks of his worries about the manning of his father’s farm at home. Soon the men are back in the line. They first make it their business to tidy a trench once badly kept up by French soldiers. They settle into a time of distracted dull fear there, until the day when, as Captain Pasley censors his men’s letters home and the platoon are relaxing after a satisfying meal, Christy Moran sees a strange yellow cloud floating over no-mans land. It is a German gas attack, but the men do not know this. It is an inexplicable sight as it advances towards them. At first the fusiliers fire into the yellow fog, but cease firing when there is no sign of an advancing enemy. The lieutenants consult their commanding officers, who are as nonplussed as their subordinates. The fog eventually reaches an Algerian trench to the platoon’s right. Screams of torment there prompt Pasley to the thought that the smoke is poisonous. The fog reaches the Dublin fusiliers’ trench and inspires panic as Irishmen, like the Algerians, begin to die. Christy Moran asks for permission for the company to retreat, but Pasley declares he has no orders to allow it. As the chlorine begins to fall into their section and men die in the trench, Pasley assents to withdrawal, but refuses to move from his post. Willie and the still-surviving men climb the parados and run for their lives amidst the general terrified scatter, every man for himself. Officers behind the line stand confused by the soldiers’ sudden, mysterious capitulation. Eventually, Willie finds himself in the air beyond the gas, and collapses. He awakens to the aftermath of the attack. Blinded men move in lines. The countryside is poisoned. Eventually, later in the week, reserve battalions move up to replace the massacred soldiers. Willie is bereft. He makes his way back to the section of trench and amidst the now-grotesque bodies of his comrades discovers the corpse of Captain Pasley. He encounters Father Buckley, blessing the bodies of the dead. The two awkwardly console one another. Over five hundred men of their regiment are dead. Later, Willie (a protestant) politely refuses communion with the priest. When Willie sees Christy Moran again, he is furious at his sergeant’s brutal assessment of Captain Pasley’s refusal to run. As more men are brought up to the line to replace his comrades, he also begins to have an inkling of the nature of the war. The survivors see out the summer into the freezing winter of 1916, hearing of more Irish losses at Gallipoli. They are posted away from the front. Willie’s platoon traverse the countryside. His memories of building reviving within him, Willie admires the roads and particularly enjoys singing marching songs, especially the ubiquitous ‘Tipperary’. Willie’s singing voice is admired but has been weakened by his faulty lungs, damaged by the chlorine gas. He also notes the damage to himself. He mourns Clancy and Williams and feels haunted by the ghost of Captain Pasley. The grief of death has lodged within him, and he secretly rails against the world. A shocking and moving read, this chapter, as it surely must be if well written. The stalling of Willie and Gretta’s relationship while Willie fights abroad is perhaps unexpected, given the account of the relationship we read in the first chapter. She is, to use a phrase used in theory, an absent presence at this point in the story. What does the silence of Gretta suggest to you about this couple’s relationship? In what ways might her silence reflect a larger truth about the presence of women in literature of the First World War? Captain Pasley, who reads Willie’s letters to Gretchen, judges that Willie is one of those soldiers who “tried to write the inside of their heads” when writing home (p.43). What do you think is meant by this? Given the evidence of Willie’s letter to Gretta (p.38), is Pasley’s assessment accurate? How would you describe Barry’s presentation of Willie in this letter? What does it reveal about Willie? The narration often uses free indirect speech: that is, the voices of the novel’s characters often merge with or are articulated through the voice of the narrator. This creates interesting ways of manipulating and moving between different characters’ perspectives, but inevitably in the story thus far, we have most often presented with the perspective of Willie Dunne. In this chapter, however, the omniscient narrator is used to voice the thoughts of Captain Pasley as he censors the men’s mail (see the paragraph that begins, “Captain Pasley was in his new dugout writing his forms…” (p.42)). Why might the author decide to give the reader access to the thoughts of this particular character at this particular moment in the novel, before the gas attack? In what way is Pasley’s reading relevant, in terms of storytelling, to the events that follow? How effective is this narratological shift of perspective? Barry’s description of the gas attack is memorable and shocking. He cleverly selects surprising foci in his description of the attack that make it particularly strange and frightening. What does the narrative describe that emphasises the transformation of the familiar world into one completely unfamiliar and peculiarly terrifying? “All the Irish were on the fire-step now, all along the length of the trench, some fifteen hundred men showing their faces to this unknown freak of weather, or whatever it might be.” Reading this sentence, and the whole of the gas attack sequence (p.43-8), how does Barry create tension within the text? As Barry builds a sense of scene in this chapter, he returns again and again to the colour yellow— at first “yellow world” of the wild flowers and caterpillars that hang on them, then the “strange yellow-tinged cloud” itself, and finally the “yellow world” that Willie awakes to, with its men wearing bleached uniforms and yellow, greased faces. What could these different kinds of yellowness represent? “If it were a battle proper, these men would never have turned tail. They would have fought to the last man in the trenches and put up with that and cursed their fate” (p.48). Besides this odd (and surely redundant) bit of moralising narration, Barry is, I think, both clever and subtle in reflecting on a broad sense of shame felt in the aftermath of the attack. Why could a gas attack be seen as particularly shameful in the theatre of war? In what ways does the use of poison gas differ to other more traditional forms of warfare? How do the characters focused on in the novel respond to the trauma of the gas attack? The passage at the end of the chapter, where Willie finds pleasure in singing marching songs like ‘Tipperary’, seems significant to the narrative as a whole. The novel, after all, is called ‘A Long, Long Way’, a metalepsis of the fuller song title, ‘It’s a Long, Long Way to Tipperary’ (see the entry ‘Opening Lines’ and comments beneath for an explanation of this term). Song, therefore, has meaning in this text (and indeed was ubiquitous in the trenches during the war: see these entries about the Ragtime Infantry and read these poems by Robert Graves, Siegfried Sassoon and Ivor Gurney.) At the end of this chapter, how does Willie’s singing, and song more generally, cause us to reflect on the gas attack on the Royal Dublin Fusiliers? How significant is it that now, “when Willie sang too mightily he felt a dire need to cough” (p.58)? The gas attack in this chapter was exceptionally well written. Before writing an appreciation, it’s best to make clear that I currently have questions about Barry’s presentation of the attack at St Julien. This is presumptuous to a degree— Barry has plainly read deeply around the subject— but I’m still trying marry up elements of the historical record with the movements of Willie’s company. On first reading, I had assumed that the gas attack depicted in the book is the gas attack of the early evening of 22nd April 1915, the beginning of the Battle of Gravenstafel Ridge, itself the first battle of the murderous Second Battle of Ypres. I thought this because this was indeed the first German gas attack of the First World War, and the absolute incomprehension of the Irish troops in the face of the new weapon depicted in the book is more readily explicable than it would be in any depiction of the later gas attack of the 24th May, when the Royal Dublin Fusiliers were massacred. 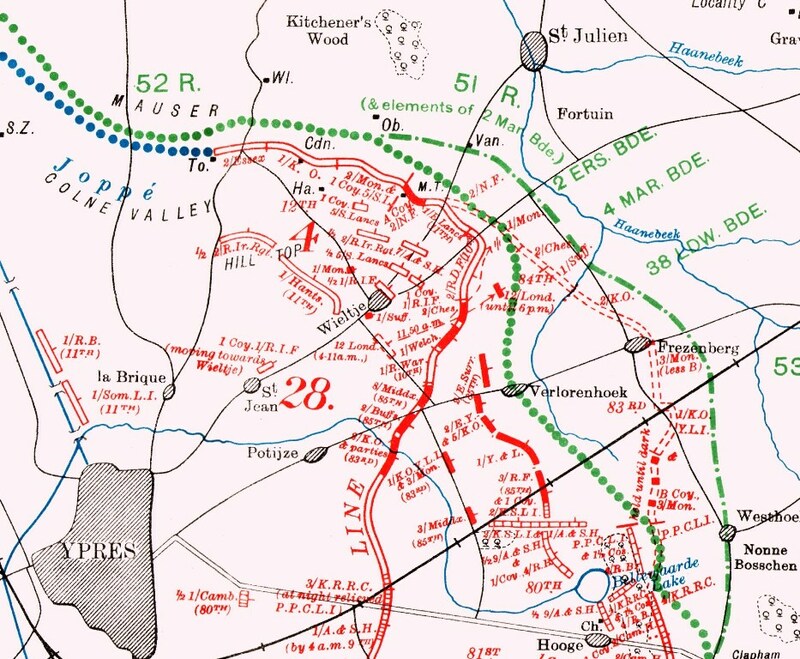 The April attack took place, as depicted in the novel, during the day-time: moreover, there was an Irish presence in the line during the attack of the 24th, the Royal Irish Fusiliers being positioned north of Wieltje, though not in a position that precisely reflects that described in the novel. The attack of the 24th May 1915 is the more likely source of the massacre described in the novel: 666 men of the second battalion of the Royal Dublin Fusiliers’ were in the line that day, and of that number, 645 men died. This chimes with Willie’s observation that there were “five hundred men and more of Willie’s regiment dead” (p.53). Crucially however this gas attack took place at night, at 2.30 in the morning, quite unlike the attack described in the book. The question that presents itself, then, is what Irish battalion Willie is part of? Willie’s first letter home in the book gives as his address the “Royal Dublin Fusiliers… Fermoy” (p.16) yet even with joining up in August 1914, and training in Fermoy in December of that year, I can’t see how Willie would have seen action at all near St. Julien in May (as far as I can discover, the second battalion of the RDF was moved from Harrow to Bolougne in August of 1914). I’m assuming that I’m missing something important here, and I’d appreciate any pointers from military historians as to how to make sense of Barry’s timeline in the novel. Of course, some might say that I’m making a category error here in bothering about this stuff. It’s fiction, you know? I think these things do matter in understanding a novel, however. If Barry has decided to conflate these two attacks, then he has done so with a purpose. That purpose would be well worth speculating on, especially as the presentation of the gas attack is so effective, so moving, so shocking. If however, I’m simply short of information, then that of course is well worth knowing too. I don’t want to speculate on what is probably a matter of my own ignorance. The gas attack depicted in the novel may be historically accurate and it may not be. Indeed, the virtues of historical accuracy can weigh against the virtues of drama or plot or authorial intention, and art is one of the only pursuits in which we can say without blushing that sometimes by making things up we can get closer to the truth of things. Yet interesting ethical and aesthetic questions are opened up here regarding the lengths of literary invention desirable or permissible in writing a historical novel (as alluded to in my earlier post on the novel form). Especially, I want to say, when reading something as convincing as Barry’s gas attack. What a piece of writing it is. The great risk in writing about a First World War gas attack is to fall into cliché and simply retread where others have gone before. Two British works of art overhang any depiction of gas warfare during the first world war; Wilfred Owen’s ‘Dulce et Decorum Est’, of course, and John Singer Sargent’s ‘Gassed’. Both are referenced in Barry’s account of the St. Julien attack: in his description of “faces [that] were contorted like devils’ in a book of admonition” and the “long lines of men going back along the road, with weird faces, their right hand on the shoulder of the man in front”. A-level Literature students should as a matter of course read Owen’s and Barry’s texts together here, exploring their commonalities and differences. Yet it seems to me that Barry’s creation stands well clear of the shadow of these more famous texts, and, by mark of its invention, to signal towards texts both more marginal and imaginative. In terms of the A-level exam, I would also want to explore the narrative strategy found in Robert Frost’s ‘Range Finding’ to explore how Barry uses the presentation of the natural world to momentarily decentre the human experience of war. Nature, it seems plain, is both a consolation and a source of grief in Barry’s novel, as it was for many of the poet-soldiers of the First World War. Its fecund life and beauty is a counterpoint to the ugly, wilful and mechanical destruction of man. The horror of the foaming caterpillars, fizzing grass, dying trees and silenced birds in the path of the chorine gas speak quite as loudly of the directionless violence of man’s death-dealing as does Barry’s horrifying description of the massacre of the fusiliers. It strikes me that the political roots of warfare are understated in the novel thus far, as the author focuses on the personal experience and horror of war. Yet in this description of the supposed inhumanity of the alien invaders and their deadly technology, Wells performs a similar trick to Barry. Colonialism and Imperial Wars—human pursuits, of which the First World War is a prime example— are refigured as assaults from beyond earthly nature, beyond humanity. Both writers manage to make the precarious empire of man both utterly strange and frightening. Indeed, I want to say that the gas cloud in chapter four is one of Barry’s most memorable characters yet: a “dark and seemingly infernal thing creeping along”, the disowned monster of the terrible and grasping intellect of man. What quaver -what heart aghast? At dawn a sentry standing on duty pulls a poppy from the top of the trench he guards. A rat jumps over his hand. At first amused, the soldier reflects on the animal’s presence on the front line. Break of Day in the Trenches: Dawn in the trenches was an important part of the soldier’s day: before dawn ‘stand to’ took place, when soldiers would man the fire-step in preparation for an attack. The speaker in this poem seems to be alone at dawn, however, and in a thoughtful or whimsical frame of mind. Rosenberg himself described the poem in a letter to his friend Eddie Marsh as “a poem I wrote in the trenches, which is surely as simple as ordinary talk” (Stallworthy, p.165). “The darkness crumbles away.”: As the poem begins, the night is ending, and, like the earth at the top of the trench, “crumbles away”. This is a poem that constantly reminds the reader of the presence of earth and dust: from the perspective of the rat who scurries close to the earth among the corpses, to the soldiers who are in constant close proximity to the dirt of the front— in life as in death. “It is the same old druid Time as ever,”: the druids were the priesthood of the ancient British pagan religion. In his ‘Anthem for Doomed Youth’, Stallworthy writes that here “we can see the figure of Old Father Time personified as a druid (standing perhaps before a druidic sacrificial altar)” (p.166). Dawn, Stallworthy explains, was the customary time for druidic sacrifice— which, of course, was also often human sacrifice. Yet all this is conveyed with what seems like a light, popular allusion— a reference to the familiar image of Father Time, sickle in hand. “Only a live thing leaps my hand, / A queer sardonic rat”: A rat appears and runs over the soldier’s hand. The rat is described whimsically: the soldier’s sense of surprise is followed by clear amusement at the animal’s peculiar (“queer”) expression, which suggests a mocking or scornful (“sardonic”) look. The rat is the first of two symbols that Rosenberg uses to subvert the pastoral mode in this poem. In the pastoral nature is idealized and opposed to the corruption of the world of men: a typical example might be Shelley’s ‘To a Syklark’. In ‘Break of Day in the Trenches’, on the other hand, it is the much-loathed rat who seems to be contemplating men— as Paul Fussell notes, “perfectly aware of the irony in the… [swapping] of human and animal roles”. “As I pull the parapet’s poppy / To stick behind my ear”: The second focus of contemplation in the poem is a flower— a poppy growing out of the parapet (that is, the top of the trench wall). The soldier pulls the poppy from the earth and places it behind his ear. The poppy, of course, is a familiar symbol of war: its redness, above all, being associated with the blood of dead soldiers (see my notes for ‘In Flanders Fields’, below). There seems something romantic, amused, even devil-may-care about the soldier’s unsoldierly gesture: more suitable perhaps to the actions of a young boy, or a lover. Note the alliteration here, whose ‘pah-pah-pah-pah’ may suggest the sound of far-off gunfire. “Droll rat, they would shoot you if they knew / Your cosmopolitan sympathies”: The rat seems oddly amused (“droll’). Here the voice of the poem becomes directed towards the rat, addressing him wryly. The rat has more freedom than the soldier who is subject to military laws that forbid fraternisation with the enemy. If the soldier shared the same “cosmopolitan sympathies” as the rat— to be ‘cosmopolitan’ means to be careless of nationality or affiliation when approaching others— then he would be shot. “Now you have touched this English hand…”: The rat is free to roam, and the soldier seems to take pleasure in its carelessness about Nationality. Remember that Rosenberg hated the war and the army with a particular passion, fighting only for money to help his family. Rosenberg, a working-class, Jewish poet-artist, was doubtless used to being an outsider, due to his class, race and creative inclination. His ironic identification with the hated trench-rat is very much a source of the poem’s power: it allows a kind of grim objectivity regarding human affairs to be expressed in an almost playful, leavened tone. “Soon, no doubt, if it be your pleasure / To cross the sleeping green between”: Blake’s Songs are once again referenced here by Rosenberg, as in ‘On Receiving News of the War’. Here the reference to “the sleeping green between” recalls Blake’s poem ‘The Ecchoing Green’ (Blake’s spelling). Note the easy colloquial tone of the writing here, with its affirmative asides: “…soon, no doubt, if…”. “It seems you inwardly grin as you pass / Strong eyes, fine limbs, haughty athletes”: the rat seems aware of the irony that he, normally the subject to man’s dominion, now wanders freely amongst the bodies of the dead. These are the same idealised, classical bodies that Brooke seems to evoke in ‘Peace’: well-sculpted men of “sharpened power”, now broken in death. Their bodies here, lying in the dirt, seem to figure the end of one ideal of heroic manhood: but perhaps also the collapse of Western civilization. “Bonds to the whims of murder”: the dead men were tied (“bonds”) to the seemingly arbitrary commands of those who directed them to ‘murder’— a strong word, this, in connection with soldiering. “Sprawled in the bowels of the earth, / The torn fields of France.”: the soldier’s corpses are metaphorically described as lying within the earth’s guts; a metaphor that seems extended by the image of France’s ‘torn’ fields, and the sense that the country has been violently eviscerated by the war. “What do you see in our eyes…?”: the poem now becomes interrogative. This passage particularly recalls William Blake’s poem ‘The Tyger’. ‘The Tyger’ interrogates how it can be that such a deadly creature as the tiger could be created by a ‘good’ God. The questioning here and the elemental imagery describing battle (“shrieking iron and flame / Hurled through still heavens”) echoes much in Blake’s poem, but most clearly perhaps the apocalyptic fifth verse after the creation of the tiger: “When the stars threw down their spears, / And watered heaven with their tears, / Did he smile his work to see? / Did he who made the lamb make thee?”. The rat is an emblem of death, like the tiger; but the heavier condemnation for both creature’s existence seems to fall on those agents in both poems that allow them to be or flourish— God in Blake’s poem, man’s violence in Rosenberg’s. “What quaver— what heart aghast?”: Again, Blakean syntax here (that is, the line is constructed in such a way that it recalls William Blake’s writing). Does the rat see fear (a “quaver”) in men’s eyes? Or perhaps the rat sees terror (“heart aghast”) within? “Poppies whose roots are in man’s veins / Drop, and are ever dropping;”: the poem concludes with a clever return to the flower which the soldier picked from the parapet at the poem’s beginning. The reference to poppies “roots” which are “in man’s veins” is a return to the old notion that poppies flourished whilst growing on the blood of dead soldiers. Like the poppy that the soldier in the poem picked (thus killing it), these poppies continually “drop”: like the dead soldiers who nourish them. “But mine in my ear is safe— just a little white with the dust.”: for a little while, the poppy behind the soldier’s ear is safe, declares the soldier. There is an irony to this, however: the poppy plucked from the earth is now dying. The whitening of the dust seems to signify the beginning of this journey towards death. The soldier’s observation seems aware of the irony: that man’s actions mean that safety is unlikely— that the “dropping” of another poppy is at best delayed for the short while this dawn scene lasts. War Horse: Albert and Joey. What with the rush towards the exams– some of you won’t need reminding that you’ve got your AS English literature examination on Monday!– I haven’t been able to post on here as I’d like. Apologies: but I do hope that the website has helped you all with your revision. Oh, and of course, the best of luck to you all! 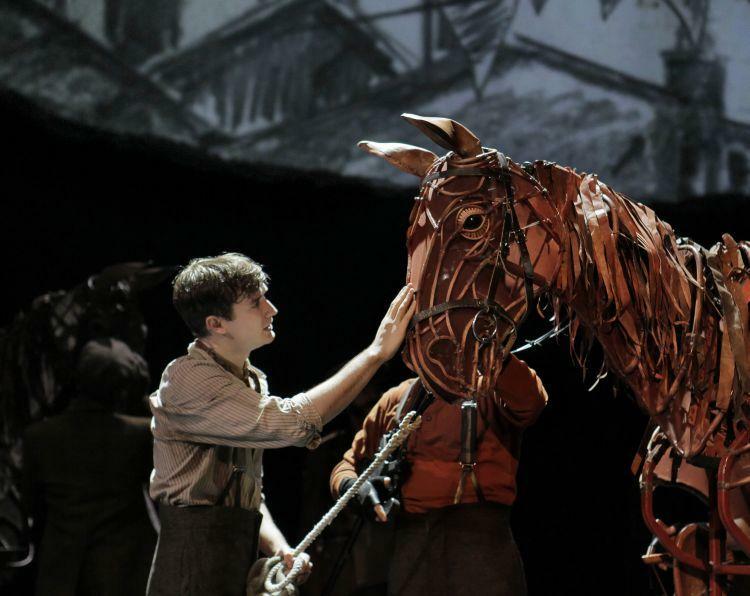 In between all the marking and moderation, however, here at Southfields we managed to take a break last week– or was it extra work?– and go on a class trip to see ‘War Horse’ at the New London Theatre on Drury Lane. Now, this isn’t a production that needs any introduction from me. ‘War Horse’, adapted from a children’s novel by Michael Morpurgo, has been running successfully on the London stage for over four years now. It recently opened on Broadway. You can check out reviews of the play in the Guardian, Telegraph and New York Times— and watch a trailer for the production here. The play follows a horse, Joey, and his best friend Albert, as they go to war in 1914. First Joey is sold to the army by Albert’s drunkard father; later Albert follows by volunteering for the front in a quest to find his much-loved companion. Both Albert and Joey are pulled into the vicious maelstrom of the war, with Albert determined to reunite the pair. Such is the basic plot of ‘War Horse’. It’s a pretty utilitarian and shaky thing, but as we all know by now, it is not simply the story that the audience comes to see: it’s the horses. ‘War Horse’ employs puppeteers to bring the horses alive on stage, and nose-twitchingly alive they seem too. When our group went to see ‘War Horse’, I wondered about these life-size, wood frame puppets: would they be up to the theatrical hype? The answer is resoundingly ‘yes’: they are indeed magical, and their transformation from inert thing to living, breathing animal is child’s-play, in the best sense: a triumph of imagination over reality. The horses are, as they say, worth the price of admission alone. Which is just as well. If what is best about this play is what is child-like– the production’s brave sense of play, imagination and adventure– what is worst about it is when it comes across as simplistic and childish. After a brilliant first half, depicting Joey and Albert growing up together and becoming inseparable friends, the play begins to unravel in quite an alarming way. Once the horse actually becomes a war horse, we’re dragged on an interminable and sometimes confusing journey across the lines with Joey, who is inevitably badly treated (animals always seem to stand in for Christ in children’s books. They should have saved time in 33 A.D. and crucified the donkey). By the second half of the play we’re firmly attached to Joey, but we frankly don’t care about his new friends and enemies, who are so mawkishly or villainously characterised that you could hardly complain if any one of them were shot and boiled down for glue. Meanwhile, there’s Albert, who once out in France persists in his monomaniac obsession with his horse. This is played quite lightly at first, for laughs, and the play is better for it. As the play moves on, however, Albert’s seemingly bottomless fixation on his childhood friend becomes first irritating then laughable; in the midst of a war in which over 16 million people died, there’s only so much anguish over a 900lb French steak that a fully grown adult can support. Fortunately, the production helps to bring gravitas to the feather-light plot and characterisation. The remarkable tanks, shocking shell strikes, and the grim march of the wounded back to ship convince just as the horses do and the story doesn’t. Still– and here’s the thing– it was still a wonderful evening. The horses and production were so remarkable, and the first half so charming, that the play could, in my opinion, support the fall-off in the second. And besides this, it was a wonderful night to share with my students, who were a credit to themselves and the school. Opinion amongst them were divided; most absolutely loved the show, but at least one didn’t like the production at all. All thought the trip was worth it though, I think. If you’re a student thinking of going, I would say get along to the theatre if you can– and come to your own verdict. It’s worth your time. This poem describes Rosenberg’s reaction to the outbreak of the First World War, conveying the poet’s sense of anxious foreboding of the horrors ahead through a series of symbols of life, death and rebirth. Isaac Rosenberg: Born in 1890, Isaac Rosenberg was a working class Jew who grew up in East London, the son of Russian émigrés. A talented artist, Rosenberg was nonetheless forced to leave school at the age of 14 because of his parents’ poverty (such an early end to education was typical, even encouraged for working class children at this time). He was indentured to a Fleet Street engraver and attended evening classes at Birkbeck College until some wealthy patrons clubbed together to enable him to attend Slade School of Fine Art. He completed his studies there in 1914, but moved in June to Cape Town, South Africa, due to illness. He was here when the Great War began. Rosenberg moved back to London in 1915 and joined up, primarily to provide money for his family. He was in France by early 1916 as a private soldier; like David Jones and Ivor Gurney (and in contrast to many of the most famous soldier poets) Rosenberg experienced the war not as an officer but in the ranks. Posted in France with the Kings Own Lancaster Regiment, Rosenberg was eventually sent to the Somme, where he was shot by a sniper at dawn on the 1st of April, 1918. On Receiving News of the War: At the beginning of the First World War— and until he returned to England in March 1915— Isaac Rosenberg was living in South Africa. Suffering from chronic bronchitis in early 1914, he was told by his doctor to move to warmer climes. He relocated to Cape Town, where his sister lived. It was from here that he heard of war breaking out in Europe. STRUCTURE: A precise and very regularly constructed poem, comprising five quatrains of simple, alternating rhyme (ABAB). Iambic trimeter (the six syllable lines, A, of three feet— hence trimeter) is followed by Iambic dimeter (the four syllable lines, B, of two feet— dimeter). This pared down, simple verse recalls the kind of verse structure that William Blake favoured in his ‘Songs of Innocence and Experience’: see ‘The Fly’ for an example of Iambic dimeter at work. “Snow is a strange white word;”: As war is declared it is high summer in Europe, but it is winter in Cape Town, which is in the Southern Hemisphere. This is obviously a striking thing for a European like Rosenberg: snow remains alien to those in South Africa. The perplexing absence of the signs of winter chime with the poet’s alienation in Cape Town from events in Europe. Note in this first line we find the alliteration that is a strong feature of this poem. “No ice or frost / Have asked of bud or bird / For Winter’s cost.”: in a European winter flowering plants die and birds migrate southwards. No such “cost” occurs in South Africa. This is a literal reading, of course: but underlying Rosenberg’s first verse is a metaphorical comparison of ‘Winter’ in Europe and Cape Town. Winter, of course, heralds death, just as war does. Winter is come in Cape Town, and metaphorically so in Europe: with inevitability death is on its way; yet in neither land is the cost of war yet felt. The assonance here— the repetition of long ‘O’ sounds, which persists throughout the poem— give this opening a soft and later, cumulatively, a mournful tone. “Yet ice and frost and snow / From earth to sky / This Summer land doth know,”: The simple language typical of the poem is especially in evidence in this second verse. Common nouns are favoured instead of ‘poetic’ description. 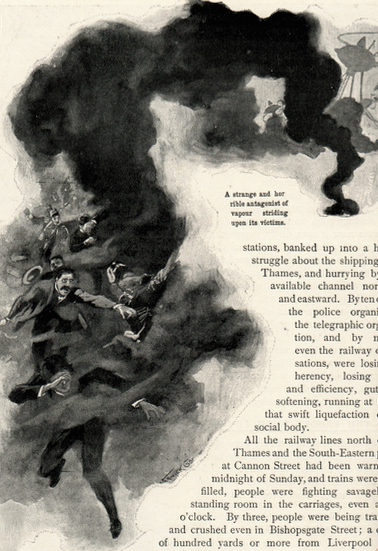 Rosenberg describes the arrival of the news of war as the arrival of “ice”, “frost” and “snow”. In choosing to describe the arrival of news of the war like this, Rosenberg lets mysterious things stand in for and symbolise events, rather describe the situation at length. The deliberately simple description gives the poem a feeling of being stripped down to essential images, a feature of Rosenberg’s writing. The “Summer land” is South Africa: its Winter is a summer to Rosenberg. “No man knows why.”: the essential mystery behind the news— why has war erupted so strangely, even in this foreign land— is insisted on in this line. This seems to suggest that the meaning of the momentous news is impossible to know. “In all men’s hearts it is.”: The poet begins to contemplate human motivation and the nature of the human soul. What is ‘it’ that is in all men’s hearts? Evil? Sin? What is it that causes the recurrent wars and murder in human history? “Some spirit old / Hath turned with malign kiss / Our lives to mould.”: despite the fact that Rosenberg was Jewish, the suggestion that there is an ancient spirit of evil in man is to a European readership a particularly Christian (specifically Augustinian) one. The doctrine of Original Sin posits the idea that all humans after Adam are ‘fallen’ and, born sinful, require the redemption of Christ. The notion of a malign (or ‘evil’) kiss is also recognizably Christian: Judas of course betrayed Jesus to the Romans with a kiss. For Jewish people the personification of evil is not as pointed as in Christianity— it is not Satan who is responsible for evil but the errors of man: this too could be called a “spirit old”. The fungal (“mould”) nature of this spirit of malignity emphasises a sense slow decay rather than active evil, a spirit of entropy and death. Note another archaism here (earlier Rosenberg uses the old word “doth”)— an echo of Blake, perhaps. “Red fangs have torn His face. / God’s blood is shed.”: ‘He’ is God. The image is an incredibly powerful, even shocking one. God, here, is very far from the one of mainstream Christian theology— omnipotent (all-powerful), omnipresent (everywhere), a spiritual rather than physical entity. Here, God has been attacked: and he sheds blood. The implication here is perhaps that God’s blood is that of those who will die in the war; but the image is uncompromising, and emphasises the power of evil, and the vulnerability of God. The use of a short end-stopped statement emphasises this (end-stopping is when a line of verse ends in a full stop). “He mourns from His lone place / His children dead.”: Again, an image of God that is far away from the speculations of mainstream Christian theology. The image of God here is of a deity distraught, alone and removed, who mourns the death of “his children”. The unorthodox Jewish Kaballah may have provided a source for this image of God in the concept of tzimtzum, in which God by an act of will in creation contracts and withdraws from the world so that it may exist. The nature of this speculation, which explains how evil can exist in a world made by a good God, is highly unsettling. “O! Ancient crimson curse! / Corrode, consume.”: the interjection, “O!” emphasises the emotional weight of Rosenberg’s final (desperate) appeal. Is this a cry of pain, or horror? The language here— an “Ancient crimson curse”— clearly recalls William Blake’s ‘Songs of Innocence and Experience’ (particularly ‘The Sick Rose’, which also perhaps influenced Rosenberg’s ‘A Worm Fed On the Heart of Corinth’). The “crimson curse” seems here to be that same “spirit old”; so that here Rosenberg seems to imagine the coming conflict as a kind of spiritual purging of evil that will act like water (“corrode”) or fire (“consume”) on man’s evil. Note the harsh insistence of the alliteration. “Give back this universe / Its pristine bloom.”: The poem ends with a cosmic- spiritual perspective on human events; the coming suffering of men is placed at the very heart of the universe. The poet prays for a world renewed and returned to its original state, like to a spotless (pristine) flower. The image again recalls Blake’s ‘The Sick Rose’ (beginning, “O Rose, thou art sick!”), but also that poem’s companion in the Songs, ‘The Blossom’, which uses a flower bloom as a symbol of joy and regeneration. There is some consolation, even in the bleak vision of the world falling once again to war at the end of this poem. Rosenberg began his poem with a wintry word, “snow”: yet with this word “bloom”, he ends with a suggestion of spring— and possible renewal. This poem is a monologue, in which one soldier speaks to the fiancé or girlfriend of a dead soldier of his death— mourning his loss and regretting that he will never have the pleasure of the dead soldier’s company again. The poem was inspired by the supposed death of Ivor Gurney’s best friend Willy Harvey in August 1916. Reality told a happier story than the drama described in the poem: Harvey was not in fact killed, but had been made a prisoner of war, returning to his fiancé Sarah Kane at the end of the war. STRUCTURE NOTE: Four stanzas of five lines, comprising three lines of free verse (ABC) and a rhyming couplet (DD). One of the most interesting things about this poem, however, is its exemplary use of alliteration (repetition of consonants for effect) and assonance (repetition of vowel sounds for effect). It is a musical poem, structured by soft sound, throughout using the ‘oh’, ‘oo’, ‘uh’ sounds denoted by the letter ‘O’, but also using ‘I’ and ‘E’ sounds to create different effects. For example, the effect of the varied ‘O’ sounds is mournful; the drawn-out vowels of ‘Ee’ slow the pace of the poem down. Alliteration, found in all four stanzas, also provides an elusive rhythm to the poem. In the first verse, for example, sibilance gives the opening a sound of susurration, of whispering. Ivor Gurney: A Gloucester man, Ivor Gurney was a talented young composer before joining the army in 1914, seemingly destined for success. He was bipolar and suffered from manic depression. He loved the Gloucester countryside and would go on ecstatic walks there, but also had two major nervous breakdowns, the first before the war (1913) and the second at the very end of the war (1918). He was suicidal during both and was discharged in 1918. His life was tragic after the end of the war: he was admitted to an insane asylum in 1922 and stayed there until he died in 1937. To His Love: The poem addresses the lover of the soldier who has died. “He’s gone… useless indeed”: A blunt and mournful statement of loss; a sense that all earlier plans have been destroyed. “We’ll walk no more on Cotswold / Where the sheep feed / Quietly…”: the Cotswolds are a famously beautiful part of the English countryside, near where Gurney grew up. Like many of the WWI poets, nature and the countryside provided consoling memories and inspiration, when contrasted to the horrors of war. “so quick”: quick here takes its older meaning, ‘full of life’. “His body… is not as you knew it”: The sinister connotations of this euphemism— that the soldier’s body has been maimed or blown apart— provides a grisly hint of what has happened to the soldier at the hands of mechanized weapons, probably shelling. “on Severn river / Under the blue…”: A powerful contrast between this peaceful image and the horror of what has happened to the soldier. Peaceful and horrific memories struggle with each other here (the Severn is the river that runs through Gloucestershire. Gurney contrasted two rivers in the title of his first poetry collection, Severn and Somme, with broadly the same meaning). “You would not know him now…”: The ellipsis here seems to suggest that the speaker doesn’t want to pursue that description of the soldier’s body when talking to his lover. Note the subdued tone the varying ‘O’ sounds give the line; and the way the the ‘n’s give the line a stuttering rhythm. This ingenious use of alliteration and assonance can be traced throughout the poem. “he died / Nobly”: the speaker quickly turns from thinking of the dead body to the noble manner of his death– doing his duty with chivalry. “cover him over / With violets of pride / Purple”: The flowers will cover him like a shroud. The purple of the violets, like the soldier “from Severn side”, symbolise pride as purple is a colour associated with kingship. “Cover him, cover him soon!”: The exclaimed repetition of ‘cover him’ shows the desperation and revulsion of the speaker. “with thick-set / Masses of memoried flowers—” The flowers must cover him ‘thickly’ to hide the horror of the body underneath. Memories of the man fight against the traumatic image of the maimed body: the flowers symbolising happier times on the Severn. This is also, in psychological terms, an account of what Freud termed repression: to turn away from, censor or bury a memory. “Hide that red wet / Thing”: The imprecision of description of the ‘red wet Thing’— his friend’s bloody and maimed body— suggests the unspeakable violence done to it. “I must somehow forget”: The last word demonstrates the tension between remembrance and forgetting that the poem says is necessary for all soldiers who have seen the consequences of bloody combat. ‘If I could only come back again, I should. From here? ‘ ‘Yes.’ ‘Many lost? ‘ ‘Yes, a good few. As a couple walk together into the wood beyond, a walker rests at the edge of a field. There, a farmer is methodically ploughing his fields with a team of horses, and the narrator and farmer fall into conversation about the war. As the Team’s Head Brass: the ‘team’ are a pair of horses led by the farmer, pulling a plough. The farmer is preparing his land for the sowing of crops; in some ways, this seems to be a timeless agricultural scene. The “head brass” are the metal bridles around the horses’ heads that allow the horses to be led. STRUCTURE: This is a narrative poem— it tells a short story. It is written in Iambic Pentameter, and has, I think, a Shakespearian feel to it: everyday events and dialogue are elevated to high poetry by Thomas’ feel for the significance of small things. “As the team’s head brass flashed out on the turn”: time is important in this poem. The poem throws us into events immediately occurring. The flash of the brass in the sunlight as the horses turn at near end of the field punctuates the poem. “The lovers disappeared into the wood.”: Lovers appear again as key figures in a Thomas poem. We only see them at the beginning and the end of the poem, but they are important symbols of love and life. In ‘In Memorium (Easter 1916)’ and ‘The Cherry Trees’ the absence of lovers is a terrible loss; in ‘As the Team’s Head Brass’ their fleeting presence is a cause for optimism and hope. “I sat… and watched”: the peaceful watching of the narrator as time passes by gives this poem a thoughtful, ponderous tone. “the fallen elm / That strewed the angle of a fallow”: the narrator sits on a fallen tree that lies on unploughed (“fallow”) land. The narrator views the farmer working the field just as he views the war in this poem; from the side, at an angle to events. “Watched the plough narrowing a yellow square of charlock”: charlock, or wild mustard, is a weed that must be cleared on arable land for farming. Thomas’ description of the “yellow square” of weed is precise and vivid. This poem utilises pastoral conventions— for example, suggesting at first the peace of the country as opposed to the war beyond— but only does so to subvert those conventions through a realistic depiction of the effects of the war. English agriculture had been in a long, steep decline since the mid-Victorian age. The countryside was a difficult place to live in 1916: this fact, rather than an idealization of the country life, comes through in Thomas’ poem. “the ploughman leaned… About the weather, next about the war.”: the farmer turns his horses to work back up the field when he reaches the narrator. They exchange pleasantries, and talk about the war. “Scraping the share… till the brass flashed / Once more.”: the “share” is the ploughshare, or blade that turns over the ground. He turns over the earth as he ploughs his lines along the field, ‘screwing’ “along the furrow”. When the farmer begins to return towards the narrator, the horses’ bridle flashes as it catches the sun. This flashing punctuates the poem, giving a sense of the slowness of rural rhythms. “The blizzard felled the elm…”: Thomas preserves the iambic pentameter here as he moves forward in his narrative, beginning a new line below. There is a sense of time having passed, but also of continuity. With the blizzard and the fallen tree, Thomas introduces an image of a mishap caused by natural forces. “‘When will they take it away?’ / ‘When the war’s over.’”: the dialogue between the farmer and narrator introduces the war for the first time. War and good husbandry seem to be contrasted. “One minute and an interval of ten…”: the rhythm of the encounter is slow, punctuated by work. The repetition emphasises this. “Have you been out?’…”: an interesting and wryly humorous conversation begins between the two. The narrator’s answer that he would join up “If I could only come back again…” shows the easiness of the two’s conversation. There is no pretence here, no mock-heroism. There is an almost documentary feeling here, and the absurd, self-deprecating humour of the watching narrator belies the seriousness of the following conversation. “Only two teams work on the farm this year…”: the significance of the single farmer working this large field is made clear by the manpower shortage caused by the war. This practical aspect is made immediately personal by the farmer’s dead friend. “The second day / In France they killed him”: this swift killing of new recruits was sadly common; new soldiers often made mistakes that exposed them to enemy fire. Sadly, Edward Thomas himself was one of these unlucky recruits, dying very soon after seeing action. “The very night of the blizzard, too”: as in ‘In Memoriam (Easter 1915)’ and ‘The Cherry Trees’, Thomas is again effective in making the presence of certain things in nature (a fallen tree) represent the absence of human beings (the man who was killed on the same night that it fell). Similarly, the blizzard here becomes linked in its devastating power to the effects of the fighting on the front. “Now if he had stayed here we should have moved the tree.”: this irony is really at the heart of the poem’s narrative. The tragedy of the farmer’s friend’s death is relayed in an unsentimental, factual way. A sense of the unremitting pressures of the farmer’s life comes through, perhaps, in his resigned attitude. “And I should not have sat here… it would have been another world”: Thomas cleverly uses this tree to emphasise the tragedy of lost possibilities that the war has brought. There is a philosophical air to this reflection on change and loss. As we have seen in ‘In Memorium (Easter 1916)’ and ‘The Cherry Trees’, this sense that the world has changed for the worse is insisted on through the small details of life that have been affected by the war. “Ay, and a better, though if we could see all all might seem good’”: a better world has been lost, agrees the farmer; though he proposes optimistically, as a form of consolation, that in the broader view the loss of his friend might be explained for the good. This comforting faith is the last thing said between the farmer and the narrator. “Then the lovers came out of the wood again:”: the reappearance of the lovers seems to reinforce this sense of hope near the poems end, yet the final three lines work to subtly undermine this. “…for the last time / I watched the clods crumble and topple over”: the absorption of the narrator in the action of the plough now seems linked to change, and by extension, the war. The crumbling clods of earth and their toppling as they fall from the plough suggest the change in the world wrought by humans; perhaps also suggesting the falling of men to earth in fields abroad. “…the stumbling team.”: the “stumbling” of the team suggest the difficulty the farmer continues to face, but also of course the loose footing of life itself. In this poem Thomas lies awake at night, listening to the rain falling onto the roof of the hut that he rests within. The rain and the poet’s solitude prompt thoughts of those soldiers who are exposed to danger and death in the world outside. Rain: This poem lies within a tradition of Romantic poetry wherein the solitary poet, contemplating or moved by nature, finds himself in connection with a wider world. Romanticism is one of the most broad and influential of all artistic and literary movements, beginning during the second half of the eighteenth century, and placing great emphasis on individual insight, feelings and imagination as a means of understanding the world. The Romantics revered nature as a source of beauty and ‘numinous’ experience— in nature they sensed the sacred, or God. ‘The Sublime’ was the name that was given for this sensation of connecting with a broader, more profound spiritual reality. The rain in ‘Rain’, then, is a part of nature that allows the thoughtful and inward-contemplating Thomas to connect with the wider world (just as, for example, in Samuel Taylor Coleridge’s ‘The Eolean Harp’, the wind playing on harp strings prompts the poet to wonder if he responds to nature similarly). Like the Romantics, Thomas finds an inspiration in nature that leads him via his memories, emotions and thoughts to a new understanding of the world around him. Where he diverges most clearly from the Romantics in ‘Rain’ is an absence of the sublime, or an explicitly spiritual dimension. Instead, in the contemplation of his death and that of others, this late Romantic poem embraces existential questions and modern alienation– in other words, the problem of finding a meaning for human existence in a seemingly hostile world. STRUCTURE: ‘Rain’ is written in blank verse— Iambic Pentameter without rhyme. This is one of the most common verse forms in English, but Thomas experiments with it very effectively. He plays with the rhythm and intensity of each line through a number of different means, each intended to give a sense of the increasing and decreasing intensity of the rain on the sounding walls of the hut, and the poet’s response to this. To create this effect, Thomas uses repetition, clever internal rhyming and also uses the spondee— a metre where two syllables within a foot have equal weight. Another feature of the poem is that it is a monologue, giving us entry into Thomas’ thoughts in solitude, in which the reader is an implied listener— ‘hearing’ the immediate fears and thoughts of the poet. “Rain, midnight rain, nothing but the wild rain…”: The poem opens describing a rainstorm at night in the kind of plain, conversational language that is a feature of the poem. In lyric poetry the use of rain to suggest sadness and melancholy might ordinarily be thought clichéd: Thomas is careful, then, to convey his thought and sensations in deliberately pared-down, simple terms. The poem’s tone is as a consequence disarmingly open, even confessional. This line introduces two important technical features of the poem. The first is the repetition of words— “rain” here, but also “solitude”, and “love”— that becomes a feature of the poem. “Rain” alone is repeated throughout the poem seven times, and in this first line as later, the repetition conveys not only the insistent force of the rainstorm outside but the also heightened consciousness of the listener. The second feature is the rhythmical variation in this and other lines. The regularity of the iambic pentameter is often challenged by the use of repeated stresses. Here Thomas uses spondee, that is, stressing two syllables in a row, and in poetry the effect of this is often to slow down the pace of a line. Along with the pauses denoted by the commas in the opening line, this gives the effect of a quickening and slowing of pace— the sort of rhythm you might hear as you listen to sheets of rain against your roof or window in a blustery storm. So the line scans something like this: “RAIN, MIDnight RAIN, NOTHing BUT the WILD RAIN…”. Thomas connects this insistent and slow spondee rhythm with the word “rain”: as with “wild rain” here (repeated again at the end of the poem). “On this bleak hut, and solitude…”: the poem begins with a melancholic, contemplative tone. “Rain”, “nothing”, “bleak”, “solitude”, “me”: these words suggest the introspective, lonely and rather depressed nature of Thomas’ thoughts. As critic Bernard Bergonzi points out in ‘Heroes Twilight’, Thomas talked of his “elaborate self consciousness” which one perceptive doctor recognized led him to depression and illness (p. 79). Note, indeed, the complicated elaboration on his thoughts and feelings over these first six lines: Thomas using enjambement to convey the flow of his conscious mind. “…and me / Remembering again that I shall die…”: Thomas’ solitude, with a heightened consciousness of his surroundings and himself, brings about what is known as an epiphany— a sudden realisation of profound meaning— in Thomas’ recollection of his own mortality. “And neither hear the rain nor give it thanks…”: the oblivion of death is contrasted to the gift of life. Thomas’ awareness of the falling rain leads to a heightened perception of the world beyond himself. “For washing me cleaner than I have been / Since I was born into this solitude.”: The image used here is one of ritual cleansing, or ablution. Ablutions— cleaning oneself with intent to purify the self or honour a god— are common rituals in the world’s religions. In this sense the rain comes as a blessing to Thomas; it first awakens him to a consciousness of death, but then provides consolation as a sign of life. Thomas’ deepening sense of a life-long loneliness, however, is emphasised by his second reference to “solitude”. “Blessed are the dead that the rain rains upon:”: Thomas pursues the idea of rain being an ablution with the image of rain blessing the dead, and thus cleansing them of sin. Note the spondee here, “rain rains”: conveying the weight of the rain through a repetition of sense and slowing of rhythm. “But here I pray that none whom once I loved”: Thomas reverts in this line to regular iambic pentameter. The effect is to move from the heightened consciousness of the rain against the roof of the hut— the thrumming that is outside Thomas’ control while the “rain rains”— to a more measured prayer, thus conveying Thomas’ effort of self-control. “Is dying tonight or lying still awake”: the internal rhyming here— “dying” with “lying”— subtly suggests the rhythmic sheets of rain on the roof, while Thomas’s mind is drawn to those caught outside in the deluge. Thomas is, of course, thinking of those soldiers serving abroad. The rain first led Thomas into isolated self-examination and thoughts of death: his spirit however rebelled, embracing the rain and the living world beyond. This feeling does not last long, however. He is forced into sympathy with those like him: awake in the rainstorm, and conscious of death. “Solitary, listening to the rain, / Either in pain or thus in sympathy”: Thomas’ own isolation— “solitary” is repeated for a third time here— draws him into agonized kinship with soldiers whom he has known (“whom once I loved”) and the possibility that they are exposed to the rain, whether injured or alone on duty. Thomas again uses internal rhyming here— “rain” and “pain”— to create an echo of the sounding rhythm of the rain. The rhyme also perhaps signifies the growing linkage of the two ideas in Thomas’ mind. “Helpless among the living and the dead,”: Thomas’s pity here, his reaching out to the exposed and the injured, contains a sense of self-consciousness too, of his own helplessness. “Like a cold water among broken reeds… all still and stiff / Like me…”: a key simile here, where Thomas pictures those exposed in the rain on the battlefield as being “like a cold water”. This conceit develops the central figure of rain. Rain has brought Thomas to a consciousness of isolation and death, but it has also signified life, and his consciousness of it has encouraged his connection with the wider world. Yet opposed to its vital energy— with which Thomas has carefully suffused the poem and its rhythms— is this image of those whom the rain falls upon. They are imagined as water at rest, cold and without life, “among broken reeds”. These countless broken reeds (“myriads”) are themselves images of broken men (the image is biblical: from Isaiah 36:6). This is an image of abjection, that is, of having fallen to the lowest possible state, of being cast down into suffering. Thomas’ imagination encompasses both the dead and these dying men caught in the rain— he too shares this feeling of abjection. Note the alliteration and assonance Thomas uses— “all still and stiff”— to maintain the strong rhythms of this poem. “Like me who have no love which this wild rain / Has not dissolved…”: Thomas expresses his kinship with the suffering (“like me”). Previously in the poem Thomas has dwelt on solitude and the rain that has awakened him to a consciousness of both life and death. At the end of the poem, Thomas becomes interested in the role of “love”, the word repeated twice in the lines following. Thomas asserts that the rain has “dissolved” his love: note the continuing use of watery metaphors, as the rain seem to lead to a dissolution of Thomas’ sense of self, of his capacity for love. In literary terms, this is an interesting turn: the rain at the end of the poem is not a clichéd Romantic symbol: it is a kind of solvent for the soul, dissolving the self. “…except the love of death, / If love it be towards what is perfect…”: the idea that only a “love of death” remains after the self has been stripped away is disturbing, even doubtful (“if love it be”), but Thomas seems to accept oblivion with a cold appreciation of his emotional circumstances. The “love of death” would later, in fact, gain a place in psychological theory. After studying the trauma victims of the Great War, Freud became interested in this drive towards self-oblivion, which he called Thanatos, the death-drive. Freud later developed the idea that this secret drive within the self, opposed to the preserving instinct for life, sought the peace of non-being. Something like a wish for this “perfect” consolation of complete oblivion seems to be conclusion of Thomas at the end of the poem. This is not to say that this poem contains a suicidal wish at the end: rather a wish for non-being, for being out of the world— out of the rain. “…and / Cannot, the tempest tells me, disappoint.”: the rainstorm, or “tempest”, has brought Thomas a vision of the nature of both life and death— it has spoken to him (“tells me”) and given a glimpse of death that is at once bleak (because like “cold water” it is inert and without life and energy) and yet consoling (because it has “dissolved” conflict).